Currently available for Stohr WF-1 race cars in either right or left exit configuration. .035″ Stainless tubing allows system to be both lightweight and durable. 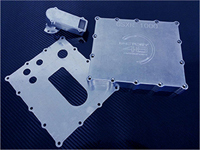 Swinging pickup wet sump pan for GSX1000. Optimized by real world testing to prevent dangerous oil pressure dips typical under hard braking and high G cornering. Factory48 Wins 2013 SCCA National Championship!